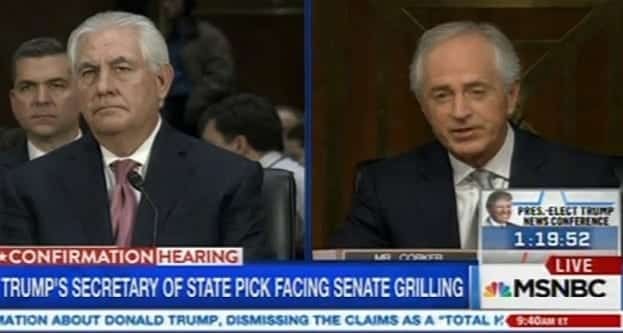 The second day of Senate confirmation hearings started Wednesday morning with President-elect Donald Trump’s nominee for secretary of state, former ExxonMobil executive Rex Tillerson facing heavy questioning, especially due to his ties to Russian President Vladimir Putin. Tillerson has downplayed his relationship with Russia, though, and his prepared remarks claim “Russia today poses a danger, but it is not unpredictable in advancing its own interests” and that “common interests” will be sought. Jeff Sessions, Trump’s nominee for attorney general, will return for his second day of questioning, and Elaine Chao, Trump’s choice for transportation secretary, will also face a line of inquiry from advocates on both sides of the aisle, but is expected not to be a heavily-challenged choice. Hearings for Betsy DeVos and Mike Pompeo have been rescheduled. This entry was posted on January 11th 2017 at 9:58am/09:58 and is filed under Elections, Live News Column 2, Politics. You can follow any responses to this entry through the RSS 2.0 feed.